Not only is Nairobi the capital of Kenya, it's also the largest city. It sits in the south-central area of Kenya and has a population of nearly 3 million people. It's a modern city, with good medical facilities, a national university, shopping complexes, good restaurants and decent public transportation. It also has a lively cultural scene. With its central location, good road access and international airport, Nairobi is a natural spot for trade and tourism. The capital of Kenya makes a good jumping-off spot to tour any other part of the country, and has several interesting sights of its own. Nairobi doesn’t have the best reputation when it comes to crime, but if you stick to the same kind of rules that go for any large North American city as well, there’s nothing to worry about. Before becoming the capital of Kenya, Nairobi was first a supply stop for the Uganda Railway. Built originally in 1899, it became the capital of the British Protectorate in 1905. It took the title from the much older city of Mombasa, namely because of the agreeable climate (Nairobi is located much higher than Mombasa, which is at the Indian Ocean) and proximity to several waterways. 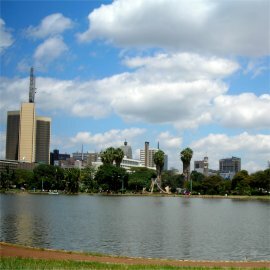 After independence, Nairobi remained as the country's capital city. 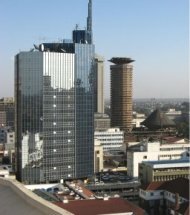 Nairobi is the largest business center in eastern Africa, and home to many international corporate headquarters. Most business is located in the Central Business District, a section of the city known for its modern skyscrapers. Companies like General Electric, Coca Cola and Cisco Systems all maintain their African offices in Nairobi. The United Nations has one of it’s 4 international headquarters here, too. The Nairobi Stock Exchange is the 4th largest in Africa. The public transit system in Nairobi consists mainly of buses, that have routes all through the city. Taxis are also plenty available. Another option which can be found in many African cities is the matatu. Matatus are small private shuttle buses that travel a set route, picking people up along the way. If you want to travel the African way, or save money (they are dirt cheap), then take the matatu. The used to drive recklessly, but the government has regulated the matatu industry more strictly recently. Traveling to and from the capital of Kenya is also straightforward. Nairobi is connected through roadways with Mombasa and other major cities in Kenya. Since the roads aren’t always of good quality, taking the train to Mombasa or other cities may usually be more convenient and faster. Nairobi’s Jomo Kenyatta International Airport is one of the better airports of Africa, and connects Nairobi to many other cities in Africa and the rest of the world. Though there are plans in that direction, there are still no direct flights to North America however. The largest attraction in Nairobi is certainly the Nairobi National Park, home to lions, giraffes, and zebras. Right in the city, you can see most of the wildlife that Kenya is famous for, without the travel time of going cross-country. Other spots you should visit when in Nairobi are the Karen Blixen museum, the Bomas of Kenya villages and Carnivore restaurant. You can always find a major hotel chain in Nairobi, and there are several smaller B&B spots too. There are a few full-service resorts, but they are more common on the coast near Mombasa or Malindi. All hotels in the capital of Kenya have English-speaking staff and the more upmarket ones also have air-conditioning and private guards.